Conrad E. Paysour, III was born in Lincolnton, North Carolina in 1961. He graduated from Lincolnton High School in 1980. In 1985, he earned a degree in economics and history from The University of North Carolina Charlotte. While attending UNC Charlotte he was awarded a Davenport Scholarship. 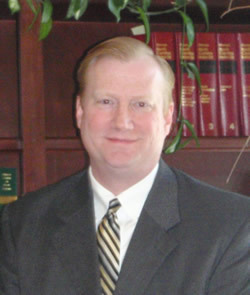 In 1988, he graduated from the College of Law at the University of Tennessee and later that year became licensed to practice law in the State of North Carolina. Mr. Paysour has been married to Jan Long Paysour, a native of Williamston, for 20 years. He has lived in Greenville, North Carolina since 1999 and is an active member of the community. He has served on the Board of Advisors of the Salvation Army as well as The Family Violence Program which is designed to prevent domestic abuse. He is an active third degree Master Mason and has served as the Master of Greenville’s Crown Masonic Lodge. He has also served as the Secretary and President of the Belhaven Lion’s Club and was a charter member and first President of the effort to save Belhaven’s historic John A. Wilkinson School. In 2009, Mr. Conrad Paysour, Mr. James Lanier and Mr. Jeremy King formed the law firm of Lanier, King and Paysour. Prior to that, Mr. Paysour had his own practice in Belhaven and was a partner in the firm of Mattox, Davis, Barnhill, Paysour & Edwards. Mr. Paysour is a long time member of the North Carolina State Bar and the North Carolina Bar Association. He is admitted to practice law before all of the Courts of North Carolina, the United States Federal District Court and the United States Federal Bankruptcy Court. He has a general law practice but also emphasizes the practice of consumer bankruptcy law, residential and commercial real estate and business law.